This book informs readers of the needs and rationale for the integration of medical and dental care and information with an international perspective as to how and where medical and dental care separated into specific domains. It provide high level guidance on issues involved with care and data integration and how to achieve an integrated model of health care supported by integrated HIT. A patient typically expects that a visit to a dentist can usually be resolved immediately. This expectation places a premium on instant, accurate, thorough, and current information. The state-of-the-art of fully integrated (dental-medical) electronic health record (EHR) is covered and this is contrasted with the current state of dental-medical software. While dentists in the US Veterans Health Administration (VHA), the US Indian Health Service (IHS), or the US military, for example, have access to fully integrated health records, most US clinicians still gather information from separate sources via fax or phone calls. 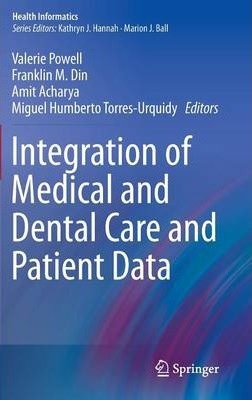 The authors provide an in-depth discussion of the role of informatics and information science in the articulation of medical and dental practices and clinical data with the focus on applied clinical informatics to improve quality of care, practice efficiency, coordination and continuity of care, communication between physicians and dentists and to provide a more comprehensive care for the patients. Lastly, the book examines advances in medical and dental research and how these may affect dentistry in the future. Most new advances in healthcare research are information-intensive. Illustrations note 33 Tables, black and white; XXXIV, 418 p.
This is the story of a simple idea (the mouth is part of the body) and what it means in the context of the complexities in healthcare organization, care delivery, provider education, and care reimbursement, along with recommendations. Integration of Medical and Dental Care and Patient Data seeks to optimize the delivery of healthcare by stating why isolated components of healthcare delivery need to work together, by asserting how health information technology (HIT) can help these components collaborate to improve care quality and patient safety, by documenting how existing barriers stand in way of interdisciplinary collaborative practice supported by HIT, and by recommending how to remove such barriers. The book will be of immense interest to all involved in the management of dental and medical informatics systems while providing illuminating instruction to dental professionals to help them understand the considerable challenges and extensive benefits of a cohesive electronic dental record. 1. Rationale and Need to Articulate Medical and Dental Data.- 2. Informatics and Technology needs and considerations to achieve the Integrated Medical-Dental Electronic Heath Record.- 3. Metrics and Measurements.- 4. Broader Considerations of Medical and Dental Data Integration.- 5. International Perspectives and Comparisons.- 6. An Integrated Medical-Dental Electronic Health Record Environment: A Marshfield Experience.- 7. Conclusion and Recommendations.